The article is intended to give Mac users an insight into the Slick Savings ads problem and provides a viable technique to get rid of this browser virus. Adware applications are steadily increasing reach as they are invading the Mac niche, with some success unfortunately. Their behavioral properties in regards to this popular platform are in no way different from the attributes of Windows-specific duplicates: they slither into machines as part of bundled downloads and add rogue browser helper objects to display annoying ads wherever the user goes online. At first sight, this may look like a web page issue, where the webmaster may have decided to get a quick return on investment and opted into an obtrusive pay-per-click campaign. But the victims promptly discover that similar promotional materials appear on different, unrelated sites, which indicates that the pest resides inside the Mac rather than the server side. All of this applies to Slick Savings, an adware plague that drives users nuts until they eradicate it. 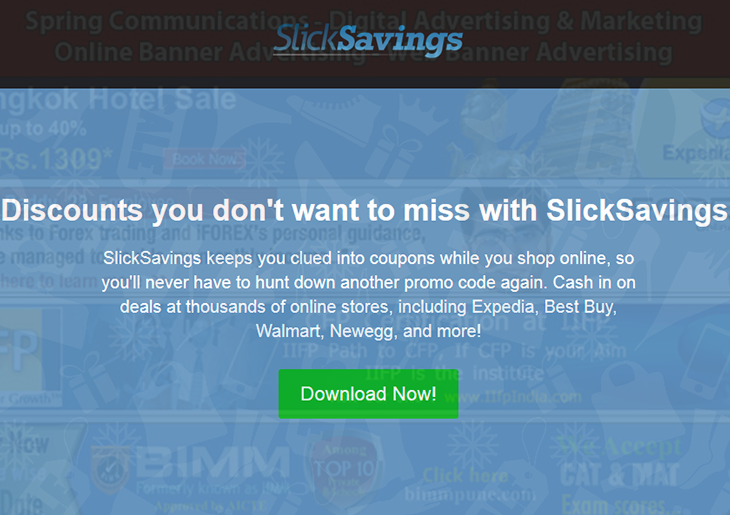 Slick Savings is considered to be a part of the Spigot family, one of the oldest strains on the adware arena. Mac users typically catch it in the course of tricky application setups. Cybercriminals love to embed malicious artifacts into packages containing several benign items. This distribution vector, commonly referred to as bundling, ensures that unsuspecting users accept the Terms and Conditions for a combo of utilities, thus also agreeing to install a potentially unwanted app like Slick Savings. Technically, the scheme is flawless from the legal viewpoint, but the ethical facet leaves a lot to be desired. Once this corrupt code infiltrates into a computer running any version of Mac OS X, it instantly configures the system to launch the bad process upon logon. Furthermore, it pulls in a cross-browser add-on that has a significant impact on the way all browsers operate. Said extension triggers promo content on ecommerce sites, search engines and other types of web pages. These objects will appear in the form of deals, coupons, freebies, comparison shopping boxes, and banners signed “Ads by Slick Savings”, “brought by Slick Savings”, or “Slick Savings ads”. Their size may be big enough to overlap the bulk of original site content, which makes the victim’s web surfing experience go down the drain. Interstitial ads and other types of pop-unders will be showing up off and on. Slick Savings does not belong on a healthy Mac. It slows down one’s web browsers, diminishes their online experience, and may collect personally identifiable data as well. Continue reading to learn how to remove this adware and get rid of the irritating ads. When confronted with malicious code like the Slick Savings on Mac, you can neutralize its toxic impact by leveraging a specially crafted system utility. The Freshmac application (read review) is a perfect match for this purpose as it delivers essential security features along with must-have modules for Mac optimization. This tool cleans unneeded applications and persistent malware in one click. It also protects your privacy by eliminating tracking cookies, frees up disk space, and manages startup apps to decrease boot time. On top of that, it boasts 24/7 tech support. The following steps will walk you through automatic removal of the Slick Savings infection. 4. Check whether the Slick Savings adware has been fixed. If the lock screen is still there, go to the Uninstaller option on Freshmac GUI. Locate an entry that appears suspicious, select it and click Fix Safely button to force-uninstall the unwanted application. 5. Go to Temp and Startup Apps panes on the interface and have all redundant or suspicious items eliminated as well. The Slick Savings fraud shouldn’t be causing any further trouble.